I'm one of girls that she growed up with this unforgettable serie! So beautiful! 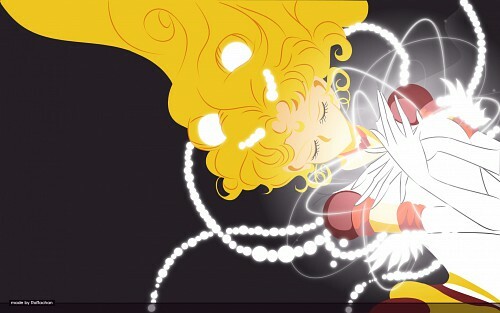 I can not forget Sailor Moon, its one of those classics that got me into anime. Awesome scan! Thanks for sharing it! I especially adore those pearls and how Sailor Moon's hair is out of her pig tails! So elegant and magical! Really beautiful work, I like especially the great light effect. Awsome! Brava! Quote by ScarXHeartSo beautiful! I can not forget Sailor Moon, its one of those classics that got me into anime. Awesome scan! Quote by SamBReally beautiful work, I like especially the great light effect. Awsome! Brava! Love the comp + design, just wish there was a bit more detail in the vectoring. Quote by liszLove the comp + design, just wish there was a bit more detail in the vectoring. She glows, very pretty and soft feeling. I love it!